The Actinobacteria, Corynebacterium pseudotuberculosis strain P54B96, a nonmotile, non-sporulating and a mesophile bacterium, was isolated from liver, lung and mediastinal lymph node lesions in an antelope from South Africa. This strain is interesting in the sense that it has been found together with non-tuberculous mycobacteria (NTMs) which could nevertheless play a role in the lesion formation. 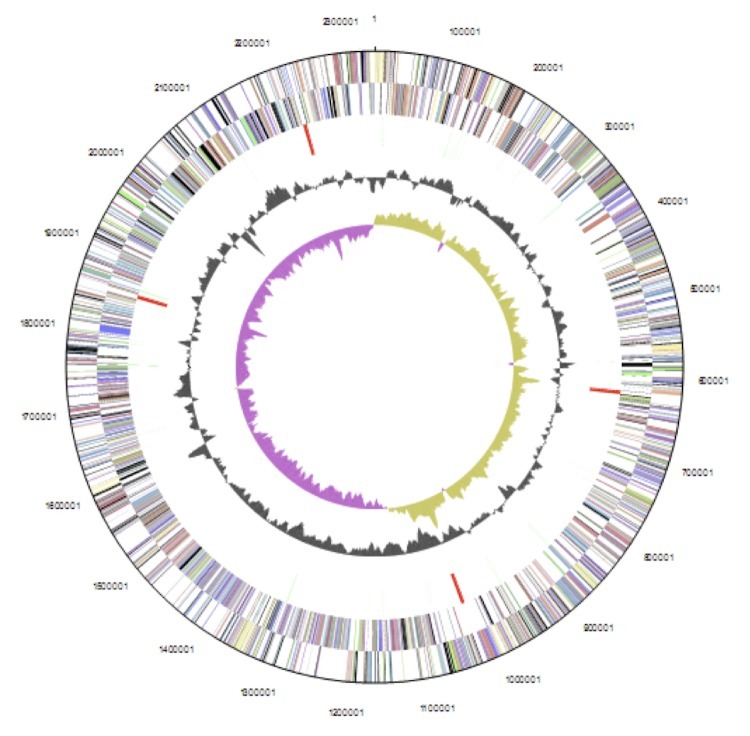 In this work, we describe a set of features of C. pseudotuberculosis P54B96, together with the details of the complete genome sequence and annotation. The genome comprises of 2.34 Mbp long, single circular genome with 2,084 protein-coding genes, 12 rRNA, 49 tRNA and 62 pseudogenes and a G+C content of 52.19%. The analysis of the genome sequence provides means to better understanding the molecular and genetic basis of virulence of this bacterium, enabling a detailed investigation of its pathogenesis. Caseous lymphadenitis (CLA) or cheesy gland  is highly prevalent in many regions of the world, resulting in huge and significant economic losses in agribusiness since it is responsible for a decrease in wool production and carcass quality . Mainly small ruminant populations like sheep and goats, and other mammals, such as bovines, pigs, deer, ovines, equines, and even, though rarely, in camels and humans, are the victims of Corynebacterium pseudotuberculosis [3-6]. The disease is characterized by the presence of caseous necrosis in external and/or internal lymph nodes [1,7]. Ulcerative lymphangitis, which is confined to the lymph vessels of extremities particularly the hind legs, is a disease caused by this bacterium in the horse [8,9]. The bacterium in some cases of human lymphadenitis, clinical strains are occasionally recovered . The prevalence of CLA in the animals scattered throughout the globe needs effective measures to control the onset of the disease in herds along with the treatment of infected animals. Numerous reports have been published worldwide where mainly small ruminants are the carriers of the C. pseudotuberculosis. They include South Africa, Brazil, United States of America, Canada, Australia, New Zealand, United Kingdom and Egypt [11-18]. Histopathological examination of antelope carcasses from a South African game reserve, a part of their routine meat inspection, showed tuberculosis-like lesions. These lesions were characterized by the presence of encapsulated necrogranulomatous inflammation similar to CLA within the pulmonary tissues, in bronchial lymph nodes, liver, kidney and some other organs of the antelopes . Diseases caused by the bacterium C. pseudotuberculosis are presented in various clinical forms as sheep and goats, affected with CLA . Among the affected animal population, the increased prevalence and rapid transmission of the disease necessitates certain measures to control disease dissemination and prevent the nearby wildlife. The analysis of the genome sequence will help us better understand the molecular and genetic basis of virulence of this bacterium. C. pseudotuberculosis is a facultative intracellular pathogen showing pleomorphic forms like coccoids and filamentous rods, with sizes ranging between 0.5-0.6 µm and 1.0-3.0 µm . Cells are described as Gram-positive, non-encapsulated, non-motile, non-sporulating and possessing fimbriae [12,20]. The bacterium was first isolated in 1888 from bovine farcy by Nocard and was first completely described by Preisz, showing its resemblance to diphtheria bacillus. The organism has been previously named Bacillus pseudotuberculosis ovis; Bacillus pseudotuberculosi and, Corynebacterium ovis [8,21]. It is a facultative anaerobe. The best growth temperature and pH are 37o C and 7.0-7.2, respectively [17,22]. After initially growing sparsely, strain P54B96 forms organized clumps on the agar surface, demonstrating dry opaque and concentrically ringed colonies. In liquid media it develops a granular deposit with a surface pellicle [8,22,23]. There exist two biotypes of C. pseudotuberculosis according to their capability of nitrate reduction. Bacteria capable of performing the reduction of nitrate are classified into biovar equi (nitrate reduction positive; mainly isolated from horses and cattle) while the bacteria which can not perform the reduction of nitrate, pertain to biovar ovis (nitrate reduction negative; frequently isolated from sheep and goats) [2,24]. Corynebacteria possess an unusual structural organization in their cell envelope, similar to the Gram-negative bacteria  and belong to a very heterogeneous CMNR (Corynebacterium, Mycobacterium, Nocardia and Rhodococcus) group that shares characteristics including an outer lipid layer, mycolic acids in the cell wall along with with its derivatives including phospholipids and lipomannans . Marchand et al. (2012) and others reported the presumed mycomembrane, an atypical outer membrane, pore-forming proteins like PorA and PorB, mycoloyltransferases, the so-called fibronectin-binding proteins like cMytA-D and cMytF, several lipoproteins and some unknown putative C-terminal hydrophobic anchored proteins . Analysis of amino acids and amino sugars of cell wall peptidoglycan reveals the presence of meso-diaminopimelic acid (meso-DAP). Major cell wall sugars are arabinose and galactose [17,27]. In addition, high and low molecular mass glucan, arabinomannan and lipoglycan also make part of the cell wall. Trehalose dimycolate (TDM) and trehalose monomycolate (TMM) are soluble cell envelope lipids . Biochemically, all strains produce acid from glucose, maltose, fructose, sucrose and mannose [21,22]. This bacterium is catalase positive and phospholipase D, beta-hemolysis and oxidase negative [23,29]. Figure 1 shows the phylogenetic neighborhood of C. pseudotuberculosis strain P54B96 in an rpoB gene (β subunit of RNA polymerase) based tree. It has recently been shown that phylogenetic analysis for the identification of Corynebacterium as well as other CMNR species based on rpoB gene sequences are more accurate than analyses based on 16S rRNA [42,43]. The rpoB gene sequences of reference strains from the CMNR group were used to construct the phylogenetic tree. 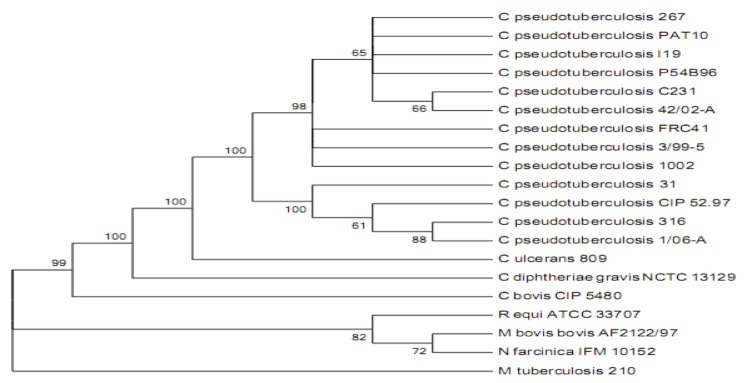 Phylogenetic tree of C. pseudotuberculosis strain P54B96 representing its position relative to type strains in Corynebacteriaceae along with some other type strains of CMNR group. The tree was inferred from 3,537 aligned characters of the rpoB gene sequence using maximum likelihood method and then checked for its agreement with the current classification Table 1. The branch lengths represent the expected number of substitutions per site. Numbers adjacent to the branches are support values from 1,000 bootstrap replicates, indicated when Larger than 60%. Calculations to determine the phylogenetic distances were done by the software MEGA v5 . Classification and general features of C. pseudotuberculosis strain P54B96 according to the MIGS recommendations . This organism was selected for sequencing on the basis of its phylogenetic position. The genome project is deposited in the Genomes OnLine Database  and the complete genome sequence is available in GenBank (CP003385.1). Sequencing, finishing and annotation were performed by the Rede Paraense de Genômica e Proteômica (RPGP), Pará, Brazil. A summary of the project information is shown in Table 2. C. pseudotuberculosis P54B96 was grown in brain-heart-infusion broth (BHI-HiMedia Laboratories Pvt. Ltda, India) in shake culture at140 rpm and at 37oC. Extraction of chromosomal DNA was performed by using 50 mL of 48–72 h culture of C. pseudotuberculosis, centrifuged at 4oC and 2000× g for 20 min. Re-suspension of cell pellets was done in 1 mL Tris/EDTA/NaCl [10 mM Tris/HCl (pH7.0), 10 mM EDTA (pH8.0), and 300 mM NaCl] for re-centrifugation under the same conditions. The pellets were re-suspended in 1 mL TE/lysozyme [25 mM Tris/HCl (pH8.0), 10 mM EDTA (pH8.0), 10 mM NaCl, and 10 mg lysozyme/mL]. The sample was then incubated at 37oC for 30 min and then 30 µL of 30% (w/v) sodium N- lauroyl-sarcosine (Sarcosyl) was added to it, incubated for 20 min at 65oC, followed by incubation for 5 min at 4oC. Purification of DNA with phenol/chloroform/isoamylalcohol (25:24:1) was followed by precipitation with ethanol. DNA concentration was determined by spectrophotometer, and the DNA was visualized in ethidium bromide-stained 0.7% agarose gel. The complete genome sequence of C. pseudotuberculosis P54B96 was obtained using the Ion Torrent PGM (Life Technologies) Sequencing Platform. A total, of 562,812 reads were generated, each with a mean size of 112 nts usable sequence (35-fold coverage). Furthermore, a hybrid de novo assembly approach was applied using 376,642 Ion filtered reads (19-fold coverage). This was carried out after quality filtering process during which reads representing an average Phred quality of less than 20, were removed. This strategy allowed closing gaps without bench work time cost . For homopolymer correction, an inherent problem of the Ion Torrent , CLCBio Genome Workbench 4.7.2 was used. Having detected a high number of frameshifts, manual curation was required prior to analysis to prevent false-positive identification of pseudogenes. The genome of P54B96 strain consists of 2,337,657 bp circular chromosome and the average G+C content of the chromosome is 52.2%. The genome was predicted to contain 2,084 coding sequences (CDS), four rRNA operons, 49 tRNA and 62 pseudogenes. For automatic annotation, different programs were used. These include; Glimmer: gene predictor , RNAmmer: rRNA predictor ; tRNA-scan-SE: tRNA predictor ; and Tandem Repeat Finder: repetitive DNA predictor . Functional annotation was performed by similarity analyses, using public databases of National Center for Biotechnology Information (NCBI) non-redundant database, Pfam and InterProScan software , which integrates multiple domain and protein family databases. Manual annotation was performed using Artemis . 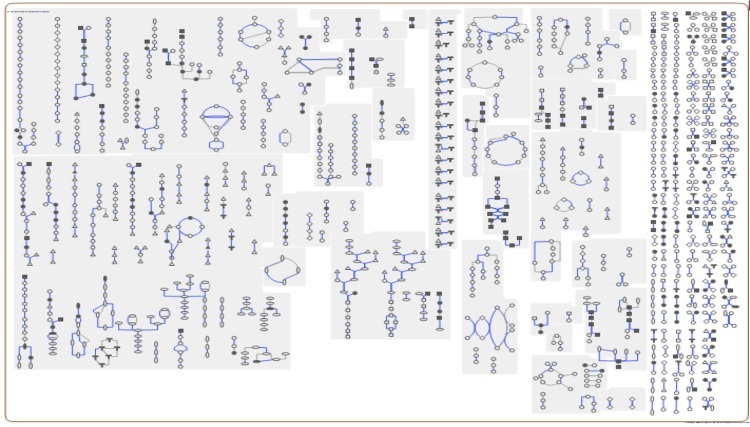 The metabolic Pathway/Genome Database (PGDB) was computationally generated using Pathway Tools software version 15.0  and MetaCyc version 15.0 , based on annotated EC numbers and a customized enzyme name mapping file. There has been no manual curation in the database and it may contain errors, similar to a Tier 3 BioCyc PGDB . The genome is 2,337,657 bp long and comprises one main circular chromosome with a 52.19% GC content. A total of 2,207 genes were predicted, among which 2,146 were protein coding genes, and 61 RNAs; 62 pseudogenes were also identified. Of the whole genome, 69.01% comprise genes that were assigned with putative functions, while the remaining genes were annotated as hypothetical proteins. The properties and statistics of the C. pseudotuberculosis genome are listed in Table 3. The distributions of genes into COGs functional categories is presented in Figure 2 and Table 4, followed by a cellular overview diagram in Figure 3 and a summary of metabolic network statistics shown in Table 5. Schematic cellular overview of all pathways of the C. pseudotuberculosis P54B96 metabolism. Nodes represent metabolites, with shape indicating class of metabolite. Lines represent reactions. We would like to gratefully acknowledge the help of all the team members & the financing agencies. Hassan S.S acknowledges the receipt of a Scholarship from the CNPq under the “TWAS-CNPq Postgraduate Fellowship Programme” for doctoral studies. This work was partially executed by Rede Paraense de Genômica e Proteômica supported by FAPESPA (Fundação de Amparo à Pesquisa do Estado do Pará), CNPq (Conselho Nacional de Desenvolvimento Científico e Tecnológico, Brasil), CAPES (Coordenação de Aperfeiçoamento de Pessoal de Nível Superior, Brasil) and FAPEMIG (Fundação de Amparo à Pesquisa do Estado de Minas Gerais, Brasil). Merchant IA, Packer RA. Veterinary bacteriology and virology. Ames: Iowa State University Press; 1967, p. 752. Jones DCM. Irregular, nonsporing Gram-positive rods. In: Smeath PHA, Mair NS, Sharpe ME, Holt JG (eds), Bergey's Manual of Systematic Bacteriology. Williams and Wilkins, Baltimore; 1986, p. 1261. Buxton A, Fraser G. Corynebacterium. In: Buxton A, Fraser G (eds) Animal Microbiology. Blackwell Scientific Publications, Edinburgh, 1977, p. 177.